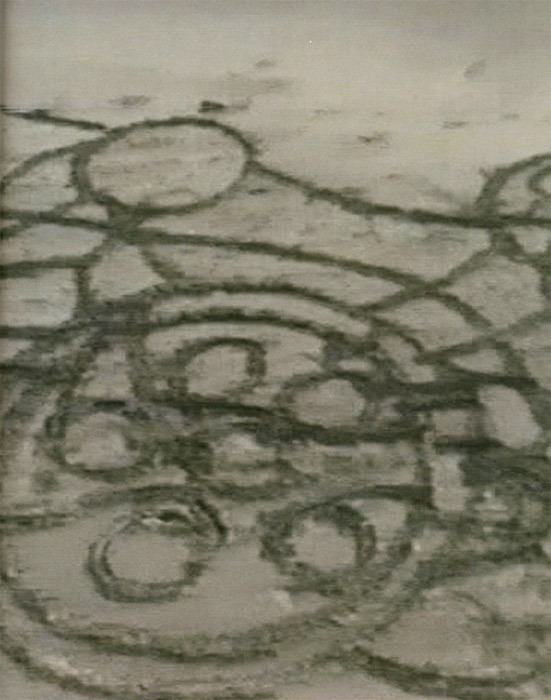 Atsuko Tanaka, Round on Sand, 1968, still from a color film in 16 mm, 9 minutes 42 seconds. 1 “Atsuko Tanaka: The Art of Connecting” (Espai d’Art Contemporani de Castelló, Spain; curated by Jonathan Watkins, Mizuho Kato, Yuko Hasegawa, and Koichi Kawasaki) In 1968 Tanaka drew large circles in the sand near the shoreline as part of her performance Round on Sand. Art doesn’t get any simpler than this. Nor does it get more splendid. Ever since encountering photographs of Tanaka wearing her legendary Electric Dress, 1956, and then seeing the 1986 reconstruction of the dress itself, I have hoped to see more work by this key member of Gutai. The show’s drawings, paintings, and, most important, films of performances (all organized here by Lorenza Barboni) confirm the artist’s strange ability to blend the spirits of Zen and child’s play in unpretentious and open works that feel totally contemporary.